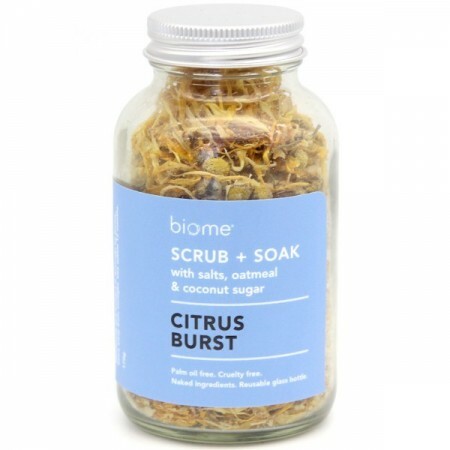 Home > Body & Beauty>Natural body care>Body scrubs>Biome Scrub + Soak "Citrus Burst"
Use as a body scrub or a bath soak, or both! Exfoliate and regenerate your skin with this uplifting, tangy blend of Epsom and mineral rich sea salts, soothing oatmeal, exfoliating coconut sugar, and pure essential oils. Beautiful quality, "naked" ingredients, unique to Biome. Suitable for all skin types. 170g in a glass bottle. A fresh approach to skin care by starting again... Reconnect with nature's way. Simply beautiful, multi-tasking skin care made with minimal pure ingredients, and packaged in glass. Biome’s unique hand-blended products cleanse, nourish and hydrate without complicated, expensive formulas. Our range is specially designed to equip your self-care pantry with multi-purpose ingredients to mix and match for your needs, including our 3-in-1 Skin Trio clay powder, pure plant oils, hydrosols and witch hazel. Palm oil free. Cruelty free. Vegan. Reusable glass bottle - no chemicals leaching from plastic, and zero waste packaging*. 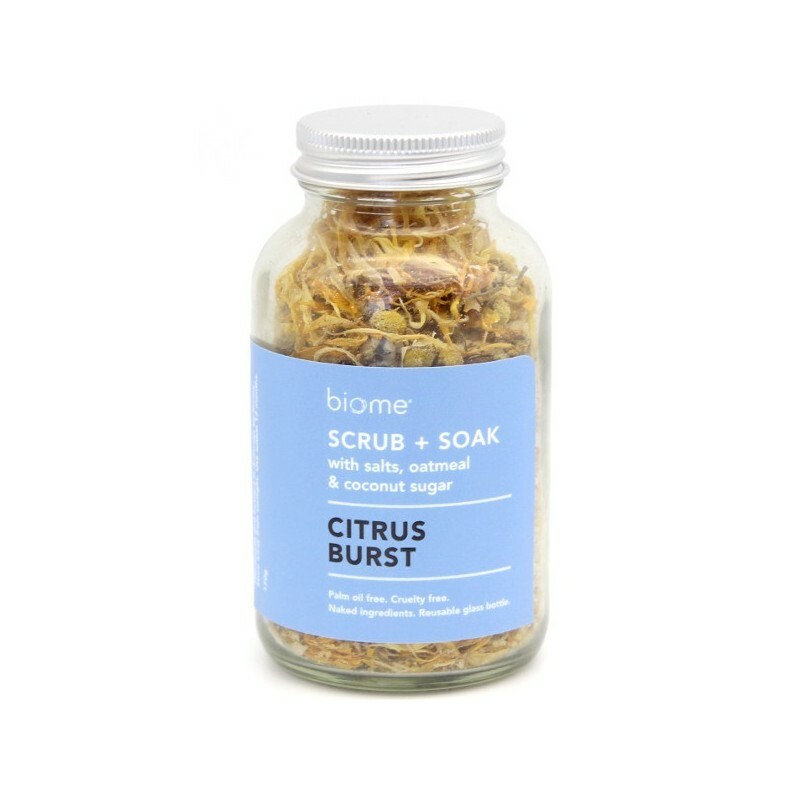 CLEANSE + SCRUB: Pour into hands and rub together, apply in circular motion all over skin. Rinse in shower or submerge in bath. Use instead of soap. SOAK: Add ¼ cup to warm running bath. Soak. Also available in Herbal Heaven, Field of Dreams, Rose Remedy. Epsom Salt (Magnesium Sulphate), Tasmanian Sea Salt, Colloidal Oatmeal, Organic Coconut Sugar, Organic Chamomile Flowers, Organic Calendula Flowers, Orange, Lemon and Grapefruit Essential Oils. Handmade and bottled in Australia by Biome. Store away from sunlight. Use within 12 months. Epsom Salts: detoxifies, soothes sore achy muscles, relaxes. High in magnesium. Good for all skin types. Softens hard water. Tassie Sea Salt: Australian, not Himalayan as most other bath salts. These flakes derived from the nutrient rich waters off Tasmania contain an abundance of naturally occurring trace minerals, rich in potassium. Removes dead skin cells, rejuvenates tired skin. Colloidal oatmeal: Natural saponins in finely ground (colloidal) oatmeal gently cleanse, soothe and moisturise. There is no need to use normal soap, so perfect for sensitive or dry skin. Organic Coconut Sugar: Exfoliates and freshens the skin. Enhances blood circulation. Unrefined, light texture making it a gentle scrub.